Oh man. 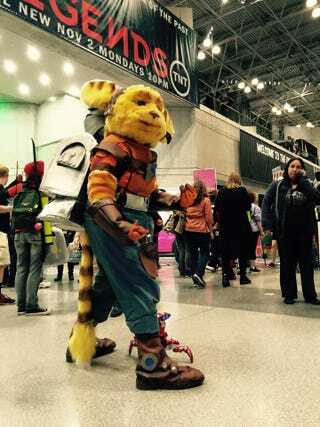 So I was dressed as Ratchet and Clank. I had a built in voice changer I’d made, and (properly! with transwear!) bound my DD’s down to a pair of not-pecs. I am only 5’1” on a good day, but Ratchet is my height, so I was good to go. I did my best to pass for male (and try to do my best James Arnold Taylor impression at that), and apparently it worked TOO well. Some dudes came up to me as I was complaining that I’d lost my keys to Aphelion (Ratchet’s spaceship) to a kid who was SO EXCITED to meet Ratchet like whoa. They dared one of their group to rub my tummy. OH MY GOD HIS FACE. HE WAS SO RED. SO INCREDIBLY EMBARRASSED. I wasn’t even mad; he wasn’t trying to feel me up as he and his crew obviously didn’t know I was a girl. He was so apologetic you have no idea. Seriously though. Those cosplay is not consent signs are there for a reason. Ask first before touching because those pecs might not be pecs. Most of the time, people asked for hugs and I’m happy to give! I’m a cuddly lombax, I know putting on that costume means people will want hugs. The difference is I shouldn’t be /obligated/ to give them. How do you deal with inappropriate touching/harassment at cons? Do you report always or do a case-by-case basis? Have you witnessed inappropriate touching or harassment and what did YOU do?